Cancels the effect of the alcohol. Has no effect on blood alcohol concentration. Drinking coffee will not reduce your blood alcohol concentration (BAC). While it may help you to stay awake, it cannot change your BAC or make you sober. If you are on an expressway. When there is a solid yellow line and a broken yellow line in the center of the road and the broken line is next to your lane, you may cross the lines to pass if there is no oncoming traffic. 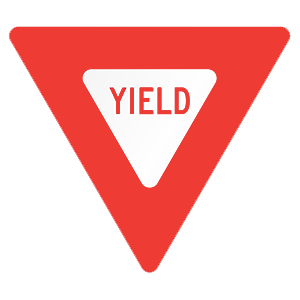 Decrease your speed as you approach an intersection with a yield sign. Prepare to stop and yield the right-of-way to vehicles and pedestrians in the intersection or crossroad. You must come to a full stop at a yield sign if traffic conditions require it. Assuming that the street is level, what should you do after you have finished parallel parking in a space between two other cars? Leave your front wheels turned toward the curb. Make sure your car almost touches the car behind you. Move as far forward in the space as possible. Straighten your front wheels and leave room between cars. The final step of parallel parking (unless you are on a hill) is to bring your wheels straight and pull forward, allowing room for surrounding vehicles to maneuver safely. While you generally may pass only on the left, there are certain conditions under which passing on the right is permitted. You should only pass on the right if you can do so safely and you do not need to drive on or across the shoulder or edge line of the road. One situation where passing on the right is allowed is when the vehicle in front of you is making a left turn. What happens if you drink alcohol while taking prescription or over-the-counter medicine? The medicine reduces the effect of the alcohol. The alcohol will help the medicine cure a cold. The combination could multiply the effects of the alcohol or medicine. There is no effect because they are different substances. Consuming alcohol and other drugs together can increase the impairing effects of both. For example, having one drink while you are also using a cold remedy could affect you as much as several drinks would when being consumed separately from any medications.